Naphthalene, phenanthrene and pyrene are all planar aromatic compounds. How can substituted version be chiral, with the chirality present in the aromatic portion of the molecule? The answer is provided by Yamaguchi and Kwon.1 They prepared peri-substituted analogues with the bulky adamantly group as the substituents. This bulky requires one adamantyl group to be position above the aromatic plane and the other below the plane, as in 1 and 2. 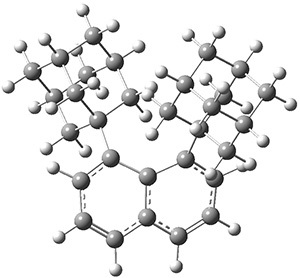 These molecules and two other examples were prepared in their optically pure form. 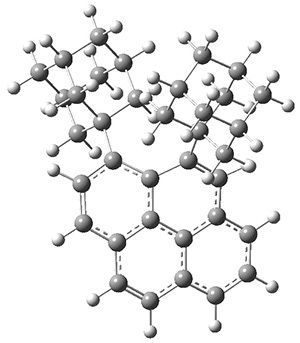 B3LYP/6-31G(d) computations were performed on both of these structures (shown in Figure 1), but computations are a minor component of the work. These structures do show the out-of-plane distortions at C1 and C8, also apparent in the crystal structures. Computations of naphthalene and 1,8-dimethylnaphthalene show a planar naphthalene backbone, but i­-propyl substitution does force the substituents out of plane. Figure 1. B3LYP/6-31G(d) optimized structures of 1 and 2. These types of systems continue to subject the notion of “aromaticity” to serious scrutiny. (1) Yamamoto, K.; Oyamada, N.; Xia, S.; Kobayashi, Y.; Yamaguchi, M.; Maeda, H.; Nishihara, H.; Uchimaru, T.; Kwon, E. "Equatorenes: Synthesis and Properties of Chiral Naphthalene, Phenanthrene, Chrysene, and Pyrene Possessing Bis(1-adamantyl) Groups at the Peri-position," J. Am. Chem. Soc. 2013,135, 16526-16532, DOI: 10.1021/ja407800e.